When Patty Young starting showing off her new line of fabric for Riley Blake, Club Havana, I was immediately drawn to the pineapple prints on knit fabric. With only 2 yards of fabric from Riley Blake, I knew I could dream up a sweet sister set perfect for summer. 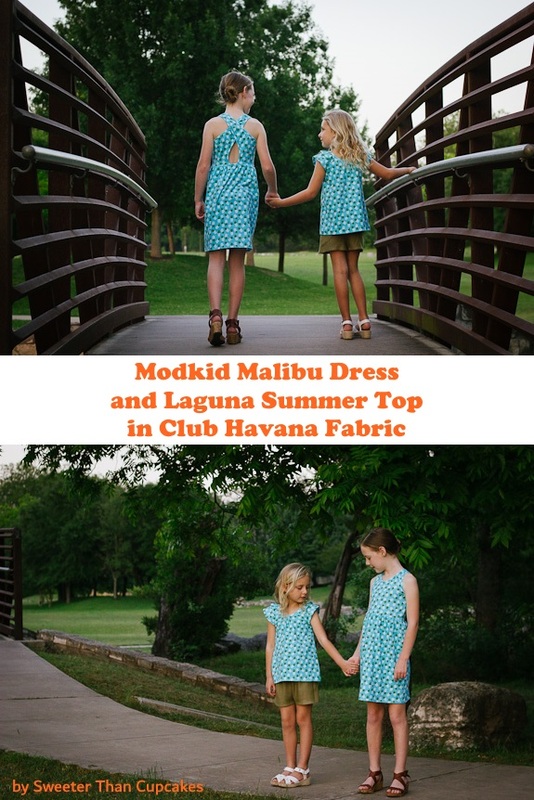 Avery immediately asked for more Modkid Malibu dresses after I made her the last one. She has declared this her favorite pattern for the summer, and I tend to agree. That back gets me every time!! It will be nice in the full heat of the summer which has already arrived here in Texas. I used the invisible stitch knit binding technique I shared over on the Modkid blog. The clean look works so well for the Malibu dress. Tandy needed a look of here own, so I went with a top and shorts combo. The top is the Modkid Laguna Summer Shirt. Even some of Tandy's goofy faces are too cute not to share. View A of the Laguna pattern features a double sleeve flutter. I've hemmed and top stitched with a twin needle here. I just unpacked my new coverstitch machine, so I'm eager to give it a go with both of these knit patterns. The shorts are the most basic style of the Modkid Spring Break Shorts. By leaving off the side pockets, these are about the fastest shorts to sew ever. I had just enough of this olive modal denim from Joann Fabrics left over from my Joy Jacket. With fabric this soft, these shorts would be comfy enough to sleep in.